Beuys, Klaus Staeck (1st chairman), Georg Meistermann (2nd chairman) and Willi Bongard (secretary), students. A school outside the academic system that admitted all students. It was founded as an "organizational place of research, work, and communication" to ponder the future of society. As a Free University it was intended to supplement the state educational system while at the same time campaigning for legal equality with that system. One of the most pressing issues for the Free International University for Creativity and Interdisciplinary Research was how to help realise the capacity of all individuals to be creative beings by advocating cross-pollination of ideas across disciplines as well as how to formulate the concept of individual freedom as the ability to shape social forms, through the transformation of resources. 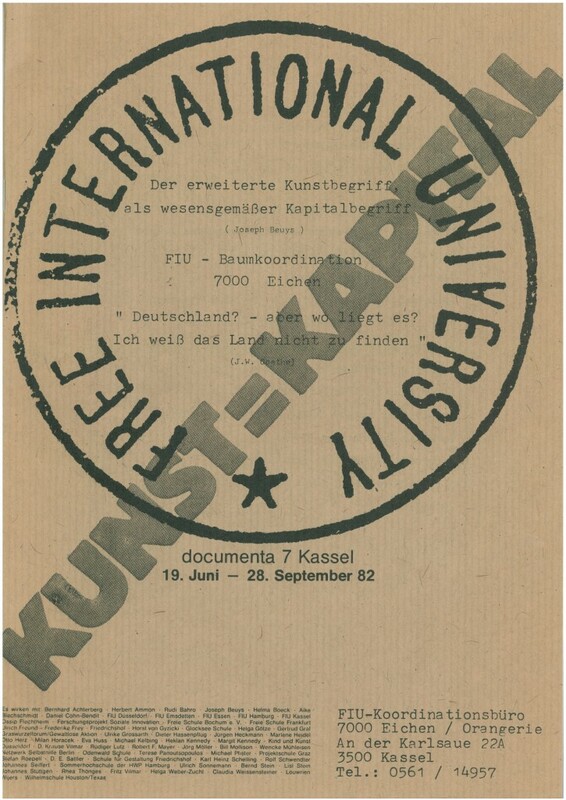 The idea of the Free International University was revisited and taken further by various people and groups, including the author Rainer Rappmann under the FIU-Verlag and the F.I.U.s in Amsterdam, Gelsenkirchen, Hamburg, and Munich, which were begun by students of Beuys. They also include the organization Mehr Demokratie e.V. and the Omnibus for direct Democracy.